SCUBA DIVER Short On Time And Just Want The Basics! Short on time and have the urge to become a certified diver? 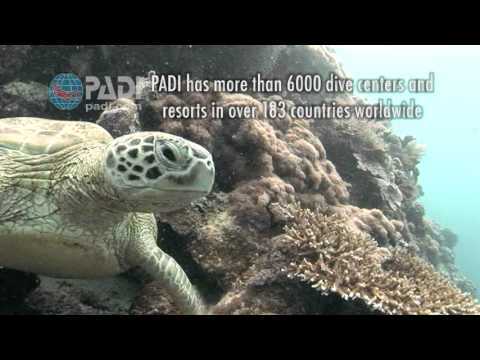 The PADI Scuba Diver certification might just be for you. This course requires less time than the PADI Open Water Diver course, covering only the first three of five sections of knowledge development, the first three of five pool sessions, and the first two of four open water training dives, resulting in a limited certification. Particularly if you expect to go scuba diving primarily in the company of a dive guide or if you have limited time to devote to scuba certification, consider becoming a PADI Scuba Diver. This certification allows for dive experience and is a good warm-up for the Open Water Diver course, if that's your ultimate goal. The Scuba Diver certification opens the door on the underwater world for anyone who's thought that a course would take too long or be too difficult. Upgrade to Open Water Diver whenever you want! With less time than the Scuba Diver course takes, you can make the jump to Open Water Diver certification and start scuba diving independently whenever time allows or you're up for more. This course is perfect for the person that has no time and is about to head away on a holiday where the dive will be guided by a Divemaster. You'll use all the basic scuba gear and some of it may be included with your course. You may want to invest in your own mask, snorkel and fins since these personal items are a lot more fun to use when they fit properly. A buoyancy compensating jacket that holds your scuba tank, a scuba regulator that delivers air, a weight system and instrumentation to monitor depth and air supply will also be used. You will wear a scuba wetsuit to enhance the comfort and relaxation during the PADI Scuba Diver Course. PADI offers a variety of home-study materials for the Scuba Diver - book and video on DVD package or a multimedia DVD. PADI's Scuba Diver materials provide a comprehensive overview of basic scuba diving skills, terminology and safety procedures. For each concept you'll read a description and watch a video demonstration. Once you're a certified diver, use the course materials as a reference guide for future diving adventures. 15 years old (or 12 years old for Junior Scuba Diver certification).